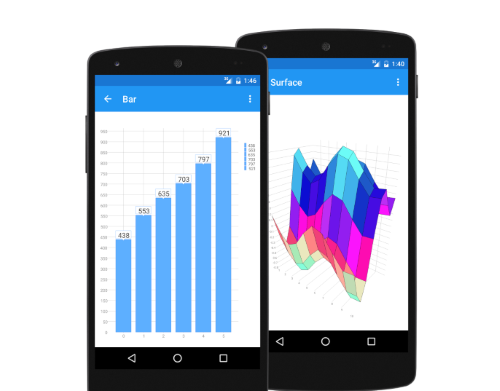 TeeChart for Xamarin.Android charting components provide support for Android mobile platform and includes 60+ chart types with maps and gauges, complete chart toolkit for additional functionality and more. Steema Software has been providing data visualization solutions to developers since 1996. Steema's flagship charting package, TeeChart, is widely acknowledged as an industry standard. For more information visit Steema Software. TeeChart Chart for Android uses the C# version derived from the TeeChart for .NET codebase. Built in Xamarin for Android. Offers a large variety of chart types, gauges and maps for business, scientific and financial applications plus gauges and maps with customizable tools for data visualization in the mobile. Default support for Android v2.1+ multi-touch versions and greater from both Windows and Macintosh environments. Chart Tool components for additional functionality, like Annotation, Colouring Bands, Series Region, Extra Legend, Fibonacci tool, etc. 100% sourcecode available. The TeeChart for .NET sourcecode version includes 100% native C# code used to build TeeChart for Xamarin.Android assembly in Visual Studio or MonoDevelop with Xamarin.Android license. Customizable color palette, Transparency, 3 color gradients, grey-scale and shadows. 2D, 3D Chart.